Let there be NATURAL LIGHT ! One of the most important rule I have learnt about landscape photography is to capture the right kind of light. Just like any other rookie, initially I scouted for locations and created images. Not that it is wrong to do that, a great location makes a huge difference. The problem comes when you travel to a great location and shoot average images which anyone could shoot. Although I always knew at the back of mind that I need to shoot at “Golden Hours” because that’s when the light is right. But I never knew its importance until I compared my shots with the top landscape photographers in the US. The main difference apart from many other differences, I realized the natural light they captured along with the great location made the image incredibly awesome. Needless to say, in order to improve my images I started shooting during the Golden Hours as well and started getting great results. However, that was not good enough for me. Every good landscape photographer I spoke to mentioned “Light” as their first rule along with location and other things. So, I thought to myself, if Light is such an important part of an image then the “Right” kind of Light should make an ordinary location look awesome too. The image below is an example of such. 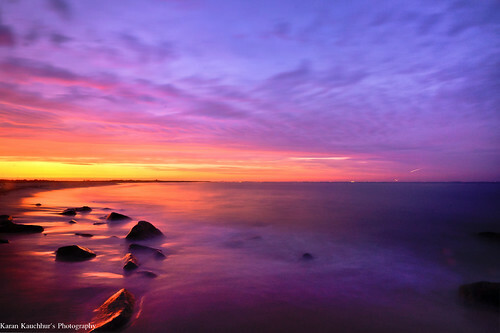 This is a spot in Sandy Hook Beach in new Jersey. I have made “believe it or not” more than 20 unique photographs in the same location. And I don’t mean a 1 mile radius, I mean 50 steps radius at the most. What makes every image unique? It’s the “LIGHT” along with other composition techniques. 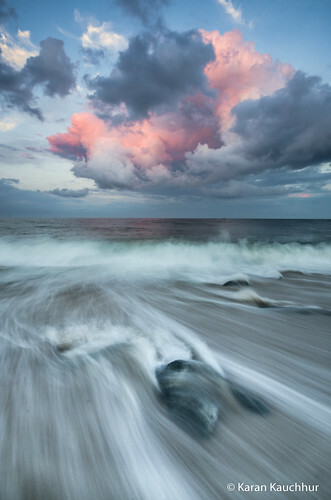 Its a very simple shot, with soft light at sunset falling on the dramatic clouds with a slight long exposure to capture the motion of the waves. This image landed up as SIGMA Corp’s Fan Photo of the Week. The image below is of the exact same spot, except that I am looking North instead of east. The clouds are not so dramatic, however the afterglow after the sunset is crazy here, and makes the image so much more interesting. So, my theory was proven correct. And this was important because it helped my improve the quality of my images a lot. All Pro Photogs know and understand this, and that’s why they make quality images. I thought of putting this blog for the rookies who might underestimate the power of Right Light in Landscape Photography. Good inputs Karan, will keep in mind while shooting next time. Can you pls put the ISO, A and S settings with which you shot the above snaps. I generally shoot at very low ISO unless the available light is very less specially after sunset.. when the last light is gone. Or if there is way too much humidity and its a night shot. Good to hear that Sandra. Can’t wait to see what your new images. The top image looks awesome, very nice flow effect.. Look forward to following your journey! Thanks for this, lovely pictures..
I’m glad you liked them ..
Randomely, would you be able to post a night time photo using your D7000 + 10-20mm? I find if I’m shooting at night, even at iso100 my images with the 10-20mm are extremely noisy!